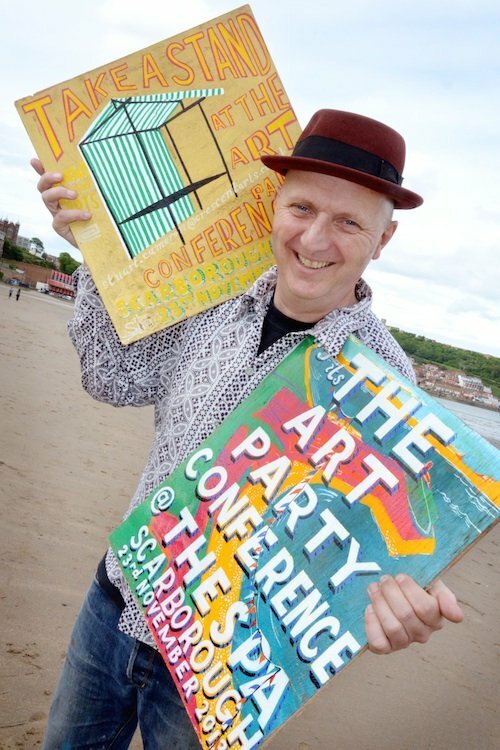 Following an approach by the Art Party – Bob and Roberta Smith’s imaginative collaboration with Start Cameron, Director of Scarborough-based Crescent Arts – a-n is offering Go and See Art Party bursaries to help artist-led initiatives and groups attend what promises to be one of the most important events in the visual arts calendar. Over 3000 artists are expected to attend The Art Party Conference on 23 November. The event will showcase a wealth of artistic talent with opportunities for debating the future of arts and education. There will be artists’ interventions, performances, film screenings, music, readings, happenings, stands, stalls, speakers, the digital fringe and installations featuring artists including Jeremy Deller, Haroon Mirza, Cornelia Parker, John Smith and Mark Wallinger. Kicking off the event will be an Art Party March through Scarborough, whilst AIR Council member Joseph Young will be delivering a provocation on art education. Artists can also attend a special AIRTIME networking session where a-n, AIR Council members and other experts will advise on how artists can ‘stand up for their practice’, including hearing about the Paying artists camapign. a-n is offering bursaries of £300-500 to non-funded groups that will enable them to ‘take a stand’ there, supporting artist-led initiatives in getting a platform to reveal their practices, projects and ultimately extend their peer networks. a-n’s Go and see, Re:view and New collaborations bursaries are part of a commitment to supporting self-determined artists’ professional development within a programme that also includes AIRTIME fast-paced information and networking sessions, the www.a-n.co.uk/granted/ seminar programme and online www.a-n.co.uk/toolkits/ and expert www.a-n.co.uk/practical-guide/.